What activities can you do on your own at the Finch Bay Galapagos Hotel? 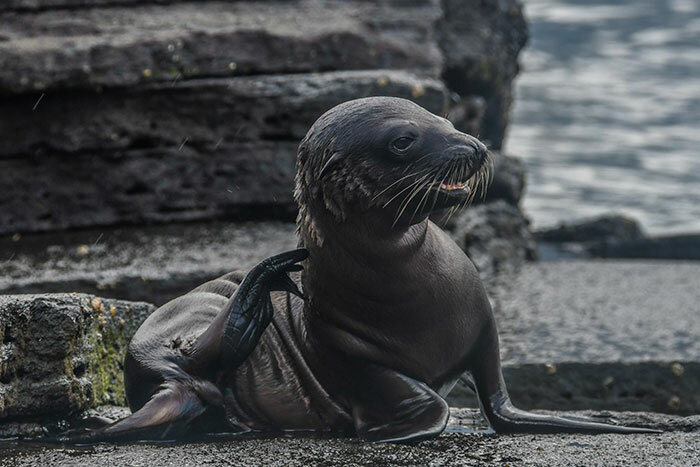 With so much to see and do on Santa Cruz Island, it’s no wonder the Finch Bay Galapagos Hotels offers a grand variety of Galapagos programs and guided tours. However, our guests often find themselves wondering what they can do on their own around the hotel. In this blog, we list the top activities we recommend doing on your own from the Finch Bay Galapagos Hotel, ordered by their proximity (closest – furthest) to the hotel itself! Step outside the beachfront gate of the Finch Bay and head down the path that leads to the right, and you’ll soon stumble upon Las Grietas (“The Crevasses”) after a short 15-20 minute hike. 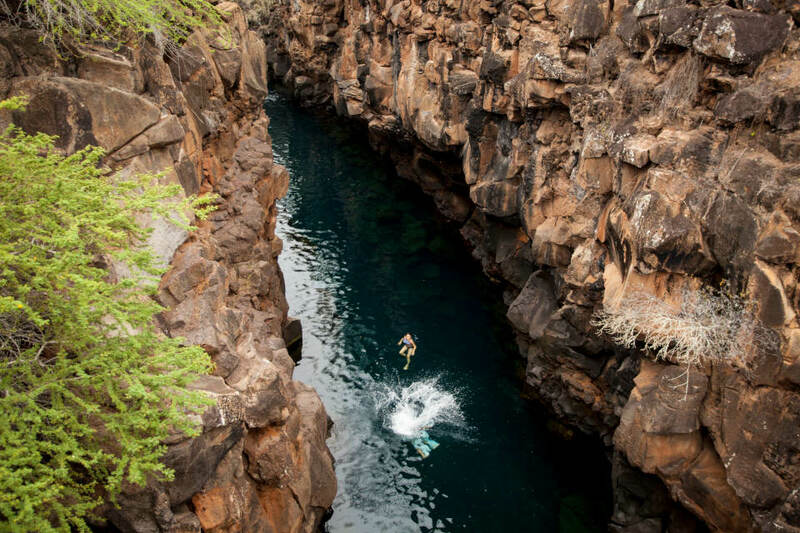 To call Las Grietas a simple swimming hole would be a disservice to its natural beauty, as it consists of three rectangular pools glimmering with emerald waters that are flanked by towering lava cliffs. A plunge in its cool waters on a hot day is a fun and refreshing activity to partake in, and it’s practically right around the corner from the Finch Bay, too! So don’t miss out on checking it out! 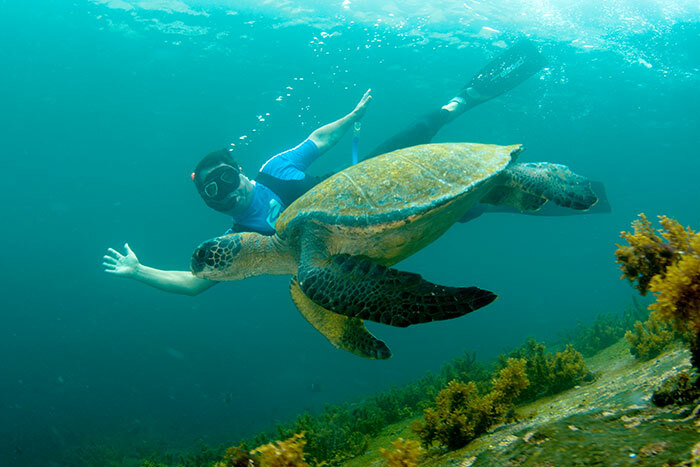 A trip to the Galapagos Islands is a step into one of the world’s richest aquatic realms. From impressive schools of colorful fish to docile white-tip reef sharks, the waters of this paradise – which happen to form a part of a UNESCO World Heritage Site – are the perfect place to interact with a wide gamut of species without having to witness them through cages or glass walls. This is why snorkeling is, quite simply, an absolute must in the Galapagos Islands! And one of the best things about a land-based option is you don’t need to go far to enjoy this natural, underwater spectacle. In fact, there’s beautiful beaches right on Santa Cruz Island that allow you partake in this activity! 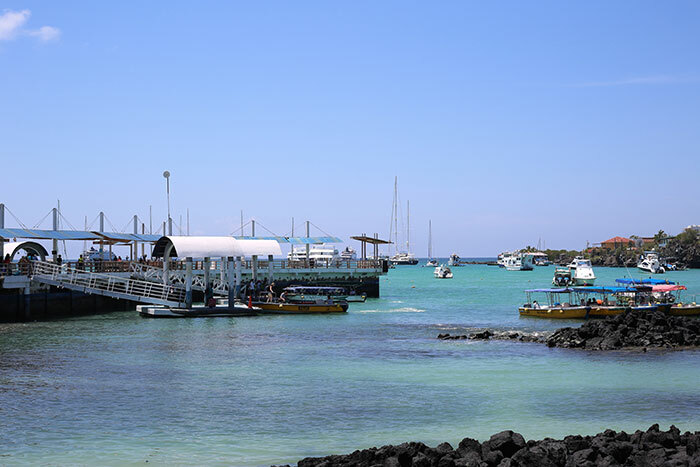 Don’t forget to rent your snorkeling gear at the Finch Bay Galapagos Hotel before heading out! 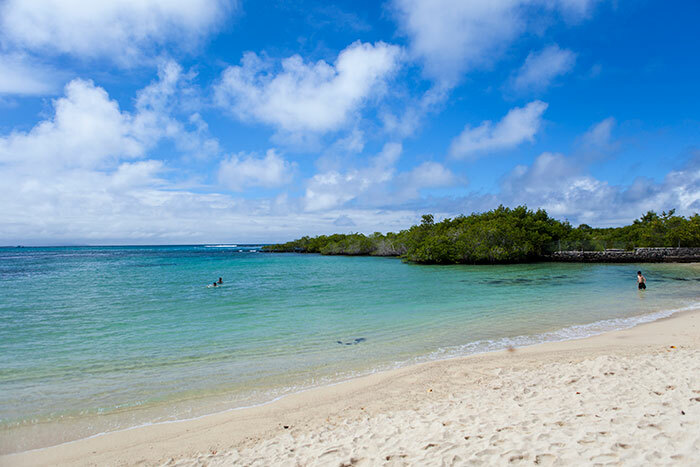 Just a few steps away from the Finch bay Galapagos Hotel (in fact, the only hotel with direct access to a beach in all of Puerto Ayora), you’ll find the crystalline waters that sit alongside Playa de los Alemanes (German Beach). This gorgeous bit of beach, protected from the strong currents and waves thanks to mangroves and reefs, is ideal for enjoying the richness of the ocean while relaxing in a peaceful and calm environment. Don’t forget to acquire your snorkeling gear at the hotel’s front desk! If you’re lucky, you’ll get the chance to swim with white-tip reef sharks, sea turtles, and a ton of colorful fish. Tortuga Bay has consistently ranked among the world’s top beaches over the course of recent years, and it’s no wonder why: this wide stretch of open, immaculate beach (that conveniently sits right on the edge of Puerto Ayora) is, simply put, spectacular. Guests that choose to head here will get to enjoy a pleasant stroll through a giant cacti forest before being rewarded with a magnificent view of this jaw-dropping slice of coast. 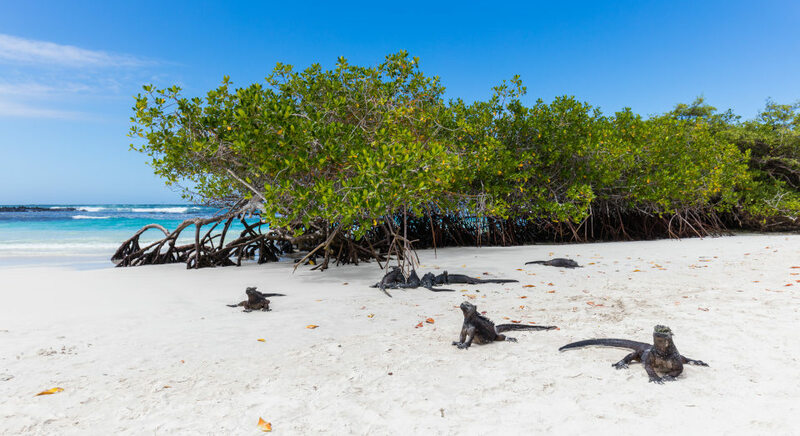 If you opt to head down the entire stretch of Tortuga Bay, you’ll be treated to a second and smaller secluded beach at the end that’s surrounded by mangroves and, occasionally, curious marine iguanas. Snorkeling here is highly recommended! The warm sand and turquoise waters at Garrapatero Beach welcome you to one of the best places to relax on Santa Cruz Island. Once you arrive at the entrance to the beach (which is located some 30 minutes away by car) you’ll enjoy a short, 15-minute walk that will reveal all of the mesmerizing, natural beauty of Garrapatero. If you get there early in the morning, you’ll get to enjoy the first rays of sunshine and admire marine iguanas soaking in the warmth on top of volcanic rock before they slide in for a refreshing dip in the crystalline waters of this fantastic place. Feel free to follow suit! Just always remember to wear sunscreen before doing so! If you pass the Charles Darwin Research Station (more on that below), it won’t be long before you come upon Playa La Estacion – a quaint yet relaxing piece of coastline that has nice and soft sand. Be aware, however, that it also has its fair share of rocky patches, especially along the shoreline and in the water, so be sure to wear proper footwear! A nice little feature of this the shore here is that it’s sheltered from the waves thanks to a line of lava rocks that stretch out into the ocean. This natural geological formation provides calm waters for snorkeling and swimming alongside the occasional marine iguana, sea turtle, and/or baby sea lion, if you’re extra lucky! One of the biggest attractions of escaping from the big cities is, without a doubt, getting the chance to enjoy clear skies and a starry night. 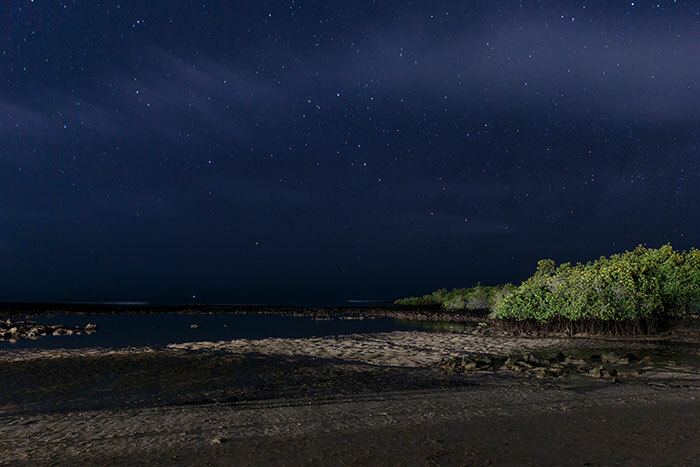 The Galapagos Islands, of which only 3% is inhabited, barely presents any light pollution at all for those people looking to enjoy the night sky and its family of stars. When you stay at the Finch Bay Galapagos Hotel, you’ll have first-row tickets to enjoy this magical festival of lights that shines overhead. All you have to do is walk right out front to Playa de los Alemanes (German Beach), put a towel down of the sand, and look up and let your eyes marvel at everything they see. If you want to observe a little bit of the local culture more closely, there’s no better place to do it than at the Santa Cruz Fish Market. Following a stroll down the boardwalk, and right before hitting the Charles Darwin Research Station, you’ll come upon this eclectic spectacle. The Santa Cruz Fish Market is a great window into the way human inhabitants of Galapagos coexist with their animal neighbors and allows you to watch as sea lions and pelicans prop themselves up against the stalls of the fish vendors, eagerly awaiting a delicious meal between the naps they take. 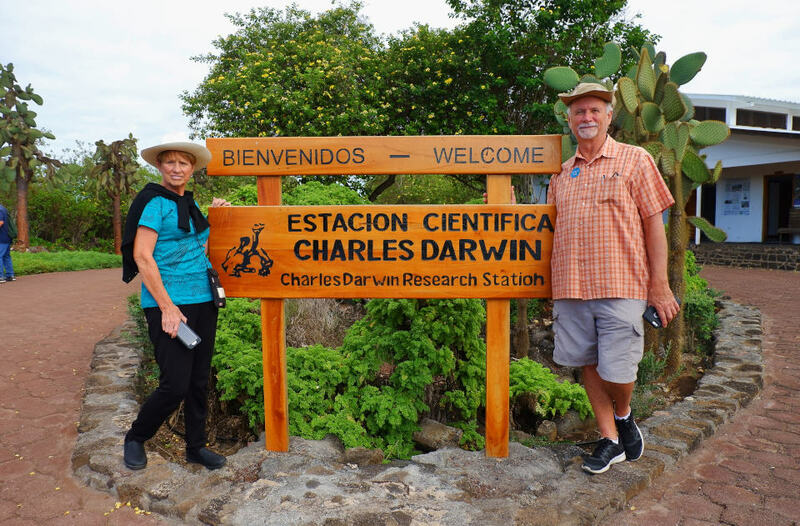 In addition to the inhabitants of the archipelago and the Galapagos National Park Service, the Charles Darwin Research Station is one of the biggest stakeholders when it comes to the protection and conservation of the islands. The Station is also involved in ongoing research project throughout the archipelago, these of which usually consists of monitoring species populations and visitor impact at several visitor sites. Their headquarters sit right at the far edge of town, which you’ll arrive at after walking along the entire length of the boardwalk. 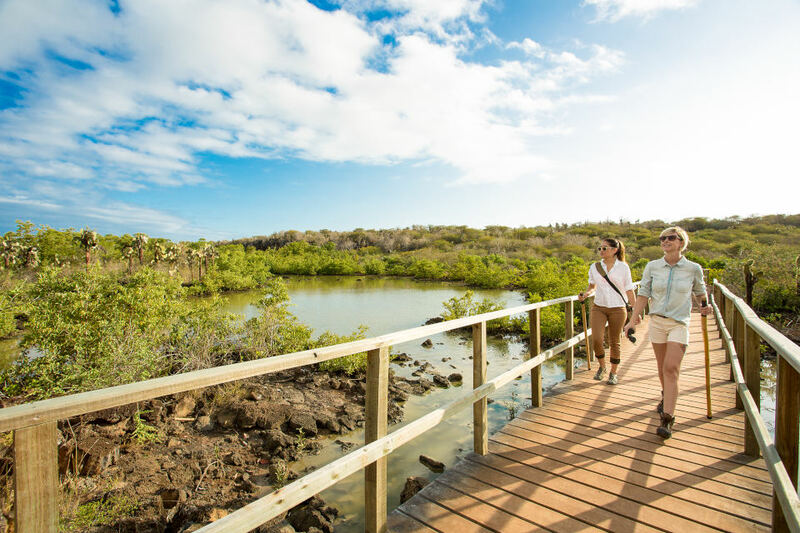 Once at the Station, you are free to walk around the different paths and trails that will let you admire much of the endemic fauna in Galapagos, as well as the numerous baby and adult Galapagos Giant Tortoises that are currently being raised in captivity. Another marvelous aspect of the Galapagos Islands is the sheer amount of distinct natural environments you can find throughout the archipelago! Within a matter of minutes, the scenery before your eyes can turn from arid and desert-like into an impressive and lush green. On the way to Tortuga Bay, and incredibly close to Puerto Ayora, you’ll get to find this peaceful patch of water that’s home to one of the richest ecosystems in all Galapagos: mangroves. The Nymphs Lagoon allows you to enjoy a relaxing, approximately 60-minute walk along the mesmerizing clusters of mangroves that surround this perfect mirror lagoon of turquoise water. It’s important to keep in mind that this lagoon is not for swimming in; however, you’ll easily get to enjoy refreshing breezes. While Puerto Ayora isn’t particularly renowned for being a museum and artistic hotspot, it does manage to offer some pleasant surprises in the form of the MAPRAE Museum and a handful of art galleries. The former offers visitors the chance to get to know a little bit more about the indigenous cultures and history over on the Ecuadorian mainland. The latter may catch your eye with their artisanal wares and amusing art pieces — none of which are made from Galapagos elements, as per the Galapagos National Park Rules!